In another attack on policemen, four drunk men hit a head constable with a beer bottle in HAL police station limits on Wednesday night. BENGALURU: In another attack on policemen, four drunk men hit a head constable with a beer bottle in HAL police station limits on Wednesday night. 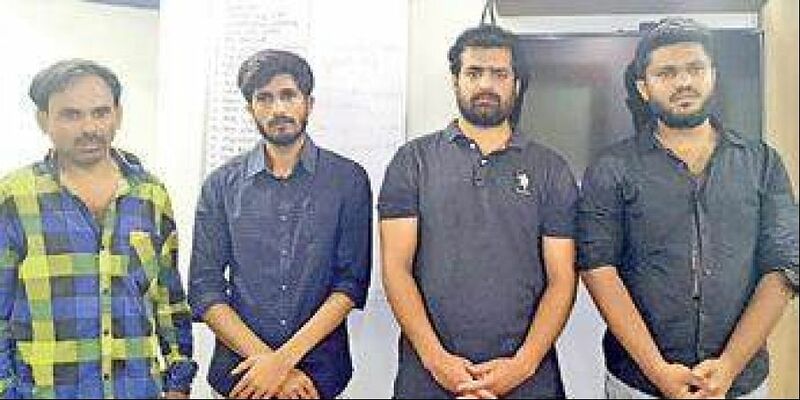 Goutham Reddy (24), a land lord, Prashath R (28), a private bank employee, Guruprasad (29), a realtor and Surya Prakash (41), an auto driver, have been arrested. All are residents of Munekolala near Whitfield. A senior police officer said at 1.30 am, a biker who was passing the Kundalahalli Gate noticed the four men creating ruckus. They even threw a beer bottle at him. The biker then alerted night-duty policemen Sundar Raj and Basavaraj. The duo arrived and asked them to come to the police station. The gang then started abusing them and in the melee, Goutham Reddy tore Sundar's uniform and hit him with a beer bottle, injuring his eye. Guruprasad then tried to stab him in the stomach. Soon other policemen rushed to the spot and nabbed Guruprasad and Surya Prakash, while Goutham and Prashanth tried to escape in their car. HAL police inspector M B Goravanakolla chased them in his jeep, and in the ensuing escape bid the accused crashed their speeding car into a wall. Both were taken into custody at 3am. “The accused were involved in anti-social activities in Munnekolala. We are gathering more details to book them in the history-sheeter list,” Goravanakolla said.In January, a series of attacks on policemen were reported. Following these attacks, city police commissioner T Suneel Kumar instructed policemen to open fire at those who tried to attack any on-duty policeman.